Item Code:UN-SR0802 Features:Stack racking is widely used in manufacturing , transportation, removing as well as packing. All UNION stack racking with powder coating or galvanized are widely used in the food and pharmaceutical industries.UNION's stack racking can be collapsible and foldable. 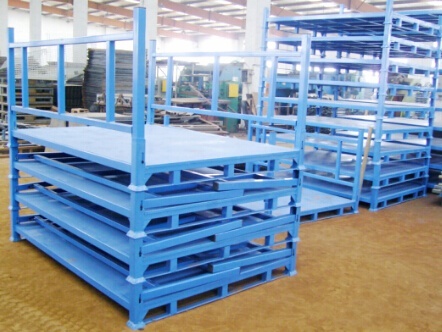 Stack racking is widely used in manufacturing , transportation, removing as well as packing. All UNION stack racking with powder coating or galvanized are widely used in the food and pharmaceutical industries. UNION's stack racking can be collapsible and foldable. Our stacking pallet is alos called stacking racking, when you want to stack the pallet and don't want to buy racking system, you can choose it, it also can be moved by forklift. 4.) We have very experienced professional engineers to make best solutions. .2) Factory price: Factory direct sale competitive price. Contact us for more details, if you are interested in! Stack racking is widely used in manufacturing , transportation, removing as well as packing. All UNION stack racking with powder coating or galvanized are widely used in the food and pharmaceutical industries.UNION's stack racking can be collapsible and foldable.